in: Categories: "Teaching with Gender" Book Series and Publications. 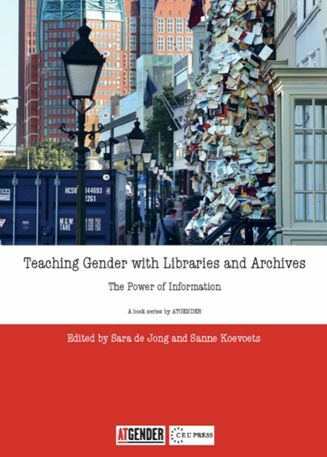 Teaching Gender with Libraries and Archives: The Power of Information was conceived of as a pedagogical tool, aimed at stimulating gender studies teachers to critically reflect, together with their students, on libraries and archives as profoundly gendered knowledge spaces. Whilst feminist standpoint theory with its recognition that knowledge always emanates from and is produced within a specific situationality is now commonplace in gender studies, libraries and archives have so far largely escaped critical feminist reflection on their status as both locations and as actors of knowledge production. Consequently, we have set out to provide an array of diverse, complementary perspectives both from within and aimed towards libraries and archives. Scholars, teachers, activists and information specialists reflect on questions such as: How can we ‘open the black box of the library’? How can we make visible the political entanglements of knowledge spaces with their social, historical, cultural and technological contexts? Are there analogies between gender studies research practices and the practices of collecting, preserving, ordering and disseminating feminist knowledge? What are the challenges involved in preserving and disseminating knowledge about gender issues? How can we produce situated feminist knowledge from within and about the social, institutional, symbolic and technological dynamics of libraries and archives? Contributions from Iceland, Cyprus, the Netherlands, France, Belgium, Italy, the UK, Italy and Germany showcase archives and libraries as lively, fast changing and thoroughly political spaces, where students can engage both critically and creatively with a multitude of feminist practices, as well as reflecting on how the relationship between power and knowledge is enacted and materialized in particular libraries and archives. Each chapter offers suggestions for activities and discussions that can be used in or adapted to teaching settings.